I just completed recording a small animation in Maya using the new Xaelander X2R2 hardware testing the upcoming Xaelander software release. I think it documents nicely what the Xaelander software suite is capable off. 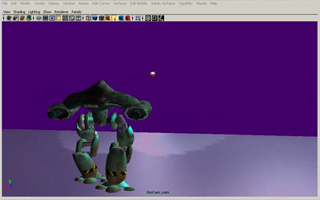 It demonstrates animating a walk cycle on the primary character and animating the secondary character. The powerful two point 3D camera tracking and animating a special effect by capturing motion onto a locator. After doing the last watch animation in Lightwave I did a small test in Lightwave at home. I think Lightwave is a very good software. The main reson for me to get into Lightwave tho is that it has this very impressive plugin renderer that really blew my mind. I tempted to underestimate anything else than Maya but I had to learn a lesson. Once you overcome the horrible interface you will meet a lot of stability, expandability and ease of use. This is just a stupid test but the main thing for me was to do an outdoor scene using fPrime. This animation replaced the regular opening theme for one episode of the famous science tv-show “Welt der Wunder” hosted by Hendrik Hey. The special episode was entirely about dolphins. How they are built up, where they live and how they propagate as well as about the danger they live in. This animation was done in Alias Maya and composed in Adobe AfterEffects. I had the help of two interns at Welt der Wunder. One was taking care of the dolphin rigging and one took care of the dolphin textures while I was setting up the environment, the logo, the effects and created the main animation. Aside of the intro we made a few animations of the dolphins organism like the cooling of their blood in the tail. Welt der Wunder – Dolphin Special from Alex Furer on Vimeo. In 1995 we started drafting a production plan for the first LEGO box that would come out with a CD-ROM. The main concept was to do 3D animated building instructions of the two main models. There were many more 3D animated building instructions and a lot of basic to advanced explanatory LEGO Technic concepts and much more In the final product. I would like to mention Claude Aebersold, Bjarne Tveskov and Christopher Yavelow, Michael Lawson and Juray Highdway, without them the 3D content would still be rendering 🙂 . The production was finished right before Siggraph that year. The CD-ROM won the “Danish Design Centre “ID98″ Prize” and the “Best Scandinavian CD-ROM” Awards. Here’s a very small excerpt of the building instructions for the Main model: The “Little Sub”. LEGO – Little Sub Buildinginstructions from Alex Furer on Vimeo.